All India Service officers dealing with forests share their service acronym with the more glamorous Indian Foreign Service, which is full of diplomats jetting off to exotic locations. The foresters, meanwhile, have to manage with the roots and branches. 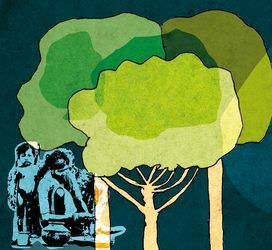 Now there is a demand from the National Commission for Scheduled Tribes that the Indian Forest Service be renamed as the Indian Forest and Tribal Service as it feels that tribals are orphaned without a Central service to look after them. At a recent meeting, commission members argued that the word tribe is used for those who depend on forests and grasslands for their livelihoods. There are a large number of tribals who live in the forests of Jharkhand, Odisha, Chhattisgarh, Maharashtra, Karnataka, West Bengal, Jammu and Kashmir and the northeastern states. A new service is, therefore, needed, to take care of the “conservation of forests and development of tribals”. The Forest (Conservation) Act, 1980, administered by the environment ministry, is focused on keeping humans out of forests as much as possible, while the Forest Rights Act (2006) administered by the tribal affairs ministry, guarantees land and livelihood rights for tribals and other traditional forest dwellers. If Indira Gandhi was responsible for the revamped Forest (Conservation) Act, which said that not even a hectare of forest land could be diverted without the permission of the Central government, her daughter-in-law Sonia Gandhi shepherded the United Progressive Alliance government’s move to give permanent rights to tribals and other forest dwellers. By declaring that bamboo is not a tree to be protected, the Narendra Modi government said it had given a big boost to the livelihood of forest dwellers. But, the department of personnel and training (DoPT), which controls the Indian Administrative Service and the general administration in the country, is not amused with the advance proposal. The DoPT, which is under the prime minister, also liaises with general administration departments of state governments on administrative and service matters. It says the idea is unworkable because not all tribals live in forests. While forest service officials have administrative and revenue jurisdiction over national parks, sanctuaries and forests, state and district administrations are in charge of all non-forest officials. And, while every district has a superintendent of police and a district forest officer, they come below the district collector in the bureaucratic pecking order. At the Central and state secretariats, it is mainly IAS officers who are in charge of the tribal welfare departments. The ministry of environment, which controls the forests, is even more ambivalent. As it has a good share of forest officials at the helm—although the secretary is from the IAS—there is a feeling that assigning a forest official to handle forest dwellers can be an interesting experiment. Officials say that in forest departments, much of the local jobs are given to tribals as they know the lay of the land as well as the bird and animal sounds and signs. But as long as the tribal lives within the forest, it is fine. What if the tribal moves out? The ministry had not been very excited about the Forest Rights Act itself, as it had been arguing that the ultimate aim should be to move human settlements out of sanctuaries and even out of buffer zones. The debate has just begun, and it might be a while before it is resolved. Or, it might get lost in the bureaucratic thickets of Delhi.